Graph showing effect sizes of a range of treatments for chronic depression and non-chronic depression. The first column represents the effect size of RO DBT compared with Treatment as Usual (e.g. Antidepressants, CBT, Counselling, etc). Lynch T. R., Hempel R. J., Whalley B., Byford S, Chamba R., Clarke P., Clarke S., Kingdon D., O’Mahen H., Remington B., Rushbrook S. C., Shearer J., Stanton M., Swales M., Watkins A. & Russell I. T. (2018). Radically open dialectical behaviour therapy for refractory depression: the RefraMED RCT. Efficacy and Mechanism Evaluation, 5(7), https://doi.org/10.3310/eme05070. Hempel, R.J., Vanderbleek, E., Lynch, T.R. (2018). Radically Open DBT: Targeting Emotional Loneliness in Anorexia Nervosa. Eating Disorders: The Journal of Treatment and Prevention, 26(1), 92-104. Lynch, T. R., & Hempel, R. J. (2016). Signaling Matters: Radically Open-Dialectical Behavior Therapy for Anorexia Nervosa. In T. Wade (Ed. ), Encyclopedia of Feeding and Eating Disorders (pp. 1-10). Singapore: Springer Singapore. Keogh, K., Booth, R., Baird, K., & Davenport, J. (2016). A Radically Open DBT informed group intervention for over-control: A controlled trial with 3-month follow-up. Practice Innovations, 1(2), 129-143. Lynch, T.R., Hempel, R.J., Dunkley, C. (2015). 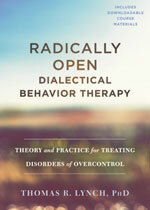 Radically Open-Dialectical Behavior Therapy for Disorders of Over-Control: Signaling Matters. American Journal of Psychotherapy, 69(2), 141-162. Chen, Eunice Y., Segal, Kay, Weissman, J., Zeffiro, Thomas A., Gallop, R., Linehan, Marsha M., Bohus, Martin, Lynch, Thomas R. (2014). Adapting dialectical behavior therapy for outpatient adult anorexia nervosa—A pilot study. International Journal of Eating Disorders, Article first published online: 27 OCT 2014 (doi: 10.1002/eat.22360). Lynch TR, Cheavens JS, Cukrowicz KC, Thorp SR, Bronner L, Beyer J. (2007). Treatment of older adults with co-morbid personality disorder and depression: A dialectical behavior therapy approach. International J of Geriatric Psychiatry, 22(2), 131–143. Lynch TR, Morse JQ, Mendelson T, Robins CJ. Dialectical behavior therapy for depressed older adults: A randomized pilot study (2003). American J of Geriatric Psychiatry, 11(1), 33–45. Lynch, T.R., Hempel, R.J., Clark, L.A. (2015). Promoting Radical Openness and Flexible Control. In John Livesley, Giancarlo Dimaggio, & John Clarkin (Eds. ), Integrated Treatment for Personality Disorder. New York: Guilford Publications, Inc.
Lynch, T.R., Seretis, D., & Hempel, R.J. (2016). Radically Open-Dialectical Behaviour Therapy for Overcontrolled Disorders: including Refractory Depression, Anorexia Nervosa, and Obsessive Compulsive Personality Disorder. In Alan Carr & Muireann McNulty (Eds.). Handbook of Adult Clinical Psychology, 2nd edition.